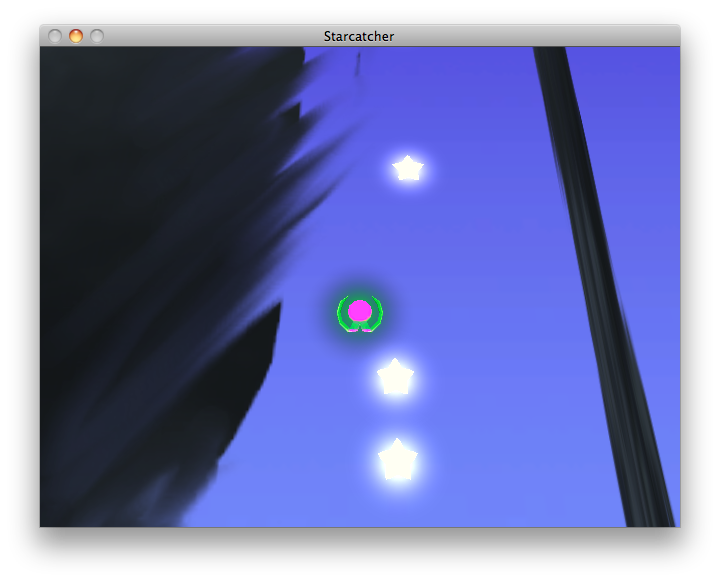 Here is some artwork and screenshots from my iPhone version of StarCatcher (taken using a PC export as I’m currently upgrading my Unity version to work with iOS 6). 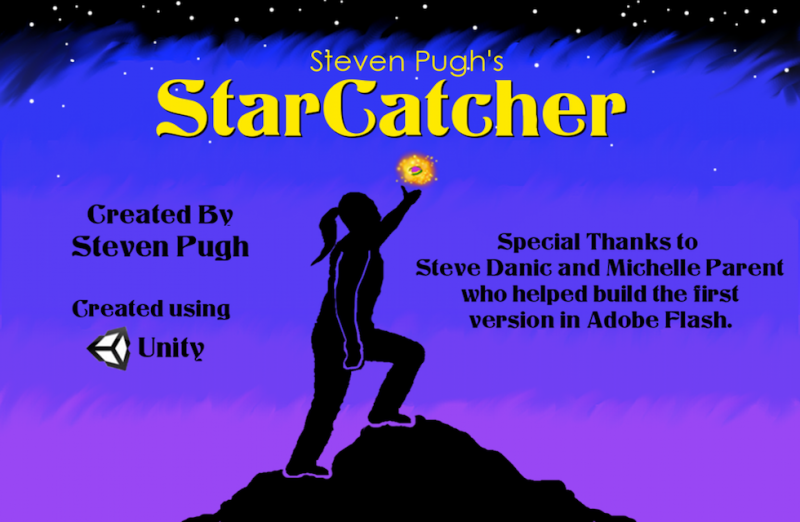 Above is the credits screen. You’ll notice a few alterations to make it more compelling. I’ve kept the look and feel of a painting, but for a stronger storyline I’ve added two main characters: a little alien and a little girl. The little girl discovers the alien in his small Jetsetter craft as he gets out of the crater formed by the mothership crashing into the earth. The alien is searching for energy to power the escape pods so they can fly back to the mothership. (So now instead of lighting lamps with stars, you’re powering UFO’s with “star energy”) The two characters help direct the story and where the levels go and I’m not saying anything more on that. 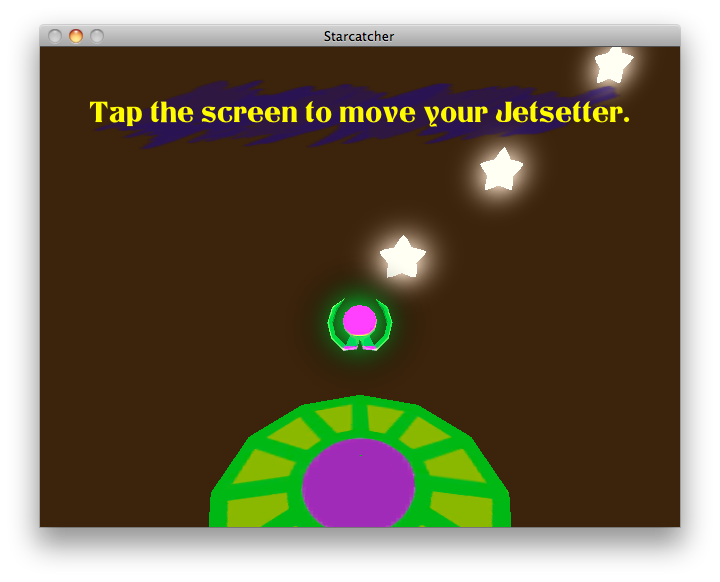 Check out the screenshots and also play the original flash game here. Getting out of the crater was the original level 1. It’s a simple question mark made out of stars to collect. It’s simple, but kind of boring. I’ve designed a more exciting hook (but have yet to implement it) where instead of starting after the crash, you’re going to start playing as the crash begins and the player will follow the mothership (trying to collect the fuel/star energy that is spraying out of it) as it careens through the sky and smashes into the Earth. This will be more like 4 levels but will be a much more exciting start to the game and will give the player a sense of importance, urgency, and excitement. Also, you’ll get to hear your commanding officer over the radio giving you tutorial orders and form a bond with that character a bit more. I prefer actual game characters giving you instructions instead of a random narrator. Black cloud walls need to be avoided as they destroy your stars. Zooming out is useful for seeing the whole maze, but to help navigate carefully staying zoomed in can be quite handy. Balancing looking at the map vs guiding your stars is a tough challenge.